What will McCain, Obama, and Clinton look like in four years? Pop Photo magazine does some digital retouching to find out. McCain better take care of those liver spots! The candidates have told us what they plan to do over the next four years, but the Photoshopping masters over at PopPhoto.com probed a more important question: What will Hillary Clinton, John McCain, and Barack Obama look like four years from now? Used the Burn and Dodge tools to deepen wrinkles and paint in age spots. Cloned the eyebrows and moved them lower. Used the Liquify filter to hollow out cheeks, make jowls, thin out lips, and enlarge ears and noses. 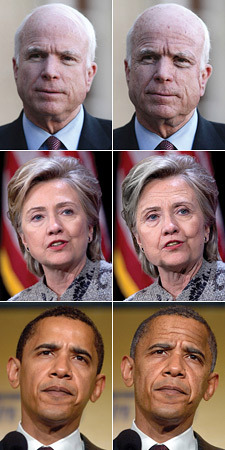 For Clinton and Obama, brought in forehead wrinkles from separate photos and used the Match Color tool to blend them in. For Obama, painted in gray hair on top of his current hair; for Clinton, desaturated with the Sponge tool to make her grayer.